Turn your shower into the focal point of your bathroom by having the trusted experts at Kennesaw Glass & Mirror install new glass shower doors at your Sandy Springs, GA home. Traditionally, most shower doors are built with a metal frame around them, which is not only unattractive, but also can interfere with the open feel of the bathroom. Our glass shower doors ditch the metal frame and use a thick tempered glass that looks great and is strong enough to stand on its own. 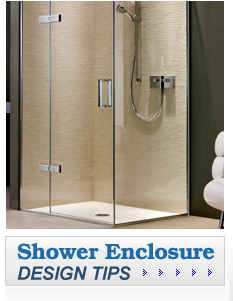 We also have our own local workshop, so regardless of the size of your shower, our experienced glaziers can customize a glass shower door that will fit perfectly into your bathroom. With an average of 20 years of industry experience, our knowledgeable team of glaziers know how to install glass shower doors quickly and efficiently, and always clean up after themselves, so your bathroom is left neat and your shower is ready to be used as soon as we are finished. Plus, at Kennesaw Glass & Mirror, we always stand behind our work with a 100 percent satisfaction guarantee and never consider the job done until you are completely satisfied, allowing you to feel confident with your decision to hire us. 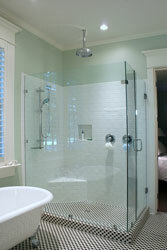 If you think your Sandy Springs, GA home could benefit from having Kennesaw Glass & Mirror install a new glass shower door in your bathroom, or if you have any questions about our glass shower doors, please contact us today.